So who owns LSD? Is it the left, and the generations that came out of the 60’s culture, or is it something else altogether? This is an amazing work, full of history largely untold about our shared Psychedelic Foundations. 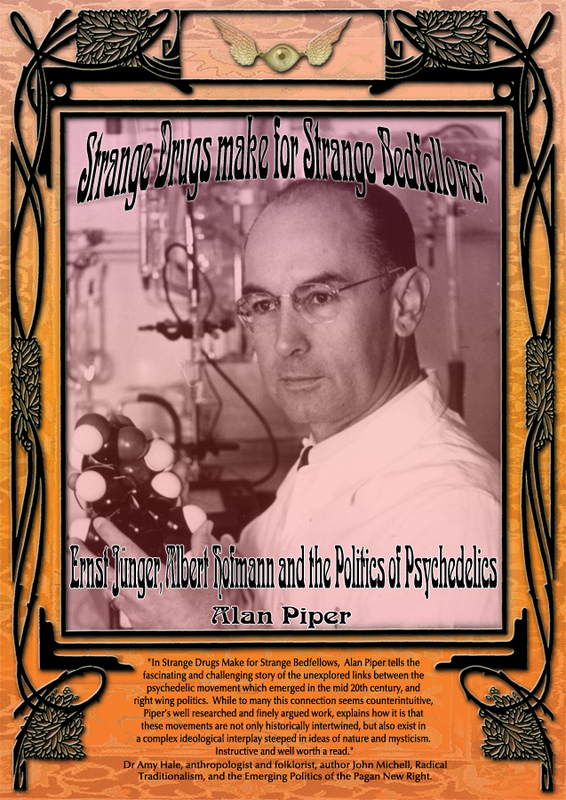 Well researched and thought out Alan lays out the deep connections that Albert Hoffman and Ernst Jünger shared, along with many others connected to the German Right Wing & Occult. This is the one book on the history of psychedelics that you should have in your library, it dares to venture into a past not commonly known. Psychedelic drugs and LSD in particular are associated with the Left Wing political radicalism and Hippie culture of the 1960s and as promising to usher in a world of peace love and understanding. However, the discovery of the powerful psychedelic drug LSD emerged in the shadow of the Second World War and has from the outset been a substance of interest to individuals of a radically conservative disposition such as Ernst Jünger, the close friend of Albert Hofmann who first synthesised LSD. That interest continues in the shape of elements of the present day Radical Right, who mix an interest in pre-war Volkish ideology and Nordic paganism with psychoactive drugs and contemporary right wing political thought. ‘Strange Drugs make for Strange Bedfellows’ examines the promotion of conservative revolutionary thought within the New Age milieu, which includes contemporary psychedelia, and the interest of individuals from the Radical Right in the role of psychoactive drugs in traditional and contemporary Nordic shamanism. “The popular view of psychedelics regards these astonishing drugs as agents of positive personal and societal transformation, signposting humanity toward the Age of Aquarius. Yet there has always been an almost wilfully overlooked and sinister nightside to psychedelia’s sun-kissed Eden. Alan Piper’s penetrating study delves deep in the murky historical backwaters of fascist thought, taking us on a long, strange, trip from the trenches to contemporary Nordicneo-paganism, where WWI warrior/philosopher Ernst Jünger’s personal and LSD informed relationship with Albert Hofmann rubs shoulders with arcane occult and right wing beliefs about psychedelics. Andy Roberts, author of Albion Dreaming: A popular history of LSD in Britain. Order Directly From The Invisible College!